Like many people, my family has enjoyed salmon as a regular part of our dinner menu for quite some time. Salmon has grown in popularity over the years due to its availability, sustainability, and nutritional value. A great tasting source of high quality protein and loaded with Omega-3 fatty acids, salmon is one of the best choices when seeking a fish protein for your plate. Now that my household is down to just two of us, we occasionally have some leftover cooked salmon in the refrigerator. When this happens I try to find an alternative way to serve the seconds. (It should be noted that leftover cooked fish should be eaten within 3 days.) One way I use up leftover salmon is to serve it cold over a tossed green salad with a nice lemon based vinaigrette. Sometimes I use the leftover salmon in a creamy fish chowder or add it to a coconut milk curry. But recently I had some leftover grilled salmon in the fridge and decided to take a walk down memory lane and mixed up some delicious Salmon Patties just like my Dad, Vinnie Lista, did when I was a kid. 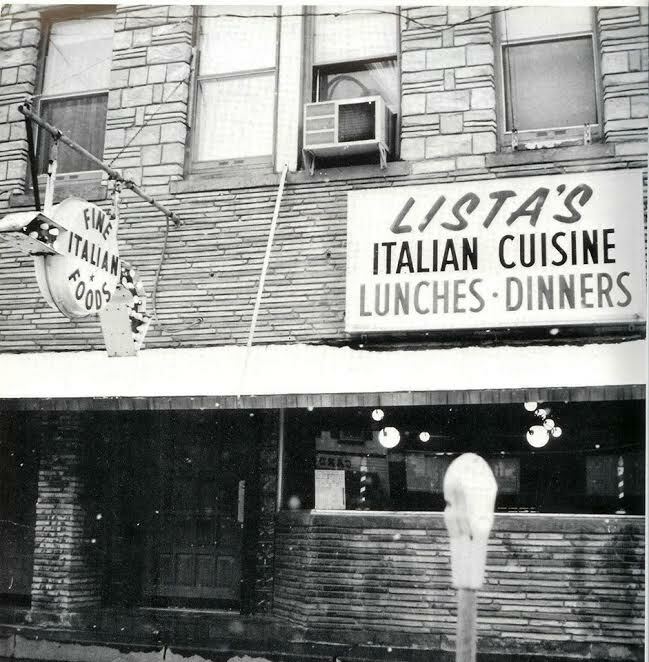 I can’t recall ever seeing grilled salmon on the menu at Lista’s Italian Cuisine… but I definitely remember my Dad making these Salmon Patties at home using canned salmon. In those days there were some lean times and canned salmon was a frugal way to feed our family of seven. Still we didn’t think of it as a cheap meal… to us Salmon Patties were a treat (of course anything fried was a treat for us kids). And all the more fun when the patties were topped with American cheese and served on a hamburg bun! I pan fried my Salmon Patties and served them with a quick Remoulade sauce. The result was moist, crispy, light tasting Salmon Patties that paired perfectly with the tangy, sharp Remoulade Sauce on the side. Although I used leftover fresh salmon that I had grilled; these Salmon Patties can be made “old school” with canned salmon, but I suggest you splurge for the boneless-skinless variety — or be sure to carefully remove the skin and bones before making this recipe. 1. Remove skin from the cooked salmon and crumble fish into a large mixing bowl (if using canned salmon pick out the skin and bones). 2. Add the minced onion, bread crumbs, eggs, mayonnaise, parsley and cayenne to the salmon and gently mix until fully combined. Season with salt and pepper if desired (this may depend on what seasoning was already on the salmon). 3. Using about 1/2 cup of salmon mixture, form into patties about 3 inches wide x 3/4 inch high. Set patties on a plate and refrigerate until ready to pan fry. 4. Heat skillet on med-high, add 1/4 cup oil and swirl to coat pan. When the oil is shimmering, carefully place salmon patties in hot oil about 1 inch apart (do not crowd pan – cook in batches if needed) and cook undisturbed about 4-5 minutes until deep brown crust forms. 5. Using a spatula/turner gently flip the patties and cook undisturbed on the other side for another 4-5 minutes. 6. Remove cooked patties from pan and place on a paper towel lined plate until ready to serve (keep warm if cooking another batch). Serve with Quick Remoulade Sauce on side. If you are not familiar with Remoulade Sauce, it is a mayonnaise based sauce similar to the more well-known “tartar sauce” but with elevated ingredients and a distinct sharpness that goes really well with fish and seafood. Most recipes call for a crunchy element such as chopped celery, capers, or cornichons (pickles). For this “quick” version I just used what I had on hand – so I chose to minced up a dill pickle. A grainy mustard is best in this recipe, but any sharp flavor mustard will work such as creole, spicy brown or Dijon. Some people say adding horseradish is a must, but I didn’t use it for this recipe. 1. Combine all ingredients in a small bowl and refrigerate until ready to serve. There you have it, Salmon Patties with Quick Remoulade sauce. A great way to use up leftover cooked Salmon. This recipe also makes a great appetizer if you form small patties (about the size of a silver dollar). I hope you enjoy this economical and delicious “old school” way to cook Salmon. Summer time is a great time to enjoy foods that are not only tasty but fun to eat. Ice cream, corn on the cob, hots dogs, potato salad, strawberry shortcake, and of course all the wonderful grilled foods we love — chicken, steaks, kabobs… and BBQ Spareribs! BBQ Spareribs are one of those foods that I only make in the summer. Maybe because the local market brings the price down at that time, or maybe because it’s more fun to eat with your hands when your sitting at a picnic table. Whatever the reason, I definitely like some ribs during those dog days. With the plentiful BBQ restaurants around town, I do get to enjoy some Spareribs more often that just in the summer — but nothing compares to the Spareribs that come off my own backyard grill. I think my Spareribs are the best (of course I think everything I cook is the best). If you’re going to make Spareribs at home you have to start with the right cut of pork. When I make Spareribs at home I like to start out with a full slab of spareribs. This means the whole bottom portion of ribs that has not been trimmed or cut into what’s known as “St. Louis style” ribs. I choose the whole slab for two reasons, first it’s the most economical (you can find packages of whole uncut ribs for a great price at many stores) and second I believe the flavor is better when you start with the whole slab because you get all the fat and bones which is where the flavor lives. Personally I also don’t bother with the more expensive “baby back” ribs — and although I do like what’s known as “country style” ribs, for barbecuing nothing beats the good ole Spareribs. Okay, now that you get the picture (pun intended) the next important step in making great Spareribs is the seasoning or “rub.” You can try the different ones you find in the grocery stores or you can do a bunch of research online for the “prize winning” rubs — but what I find is most people have the ingredients for a great rib rub in their spice pantry and you can whip it up in no time at home. 1. In a small mixing bowl whisk together all ingredients until fully combined. Rub into all sides of meat before cooking. I make my rub sugar free but if you like a sweet rub then add the brown sugar. Store extra rub in an air-tight container at room temperature for up to one month. Makes about 1/2 cup rub enough for one full slab; double or triple the recipe if making more ribs. Now that you’ve picked out your ribs and made your “rub” you’re ready to get cooking. Here is my favorite way to prepare fall-off-the-bone tender Spareribs that will be the highlight of your next cookout. This method uses the oven to get that “low ‘n’ slow” tenderness that is usually found in smokehouse barbecue. Using the oven also makes it so you spend less time standing over the grill. 1. Preheat oven to 275 degrees F and set rack in center. 2. Remove ribs from packaging, rinse and pat dry with paper towels. 3. Turn ribs bone side up and remove the membrane covering the bones: Use a sharp knife to lift a corner of the membrane and then using a paper towel, grip the membrane and firmly and evenly pull it off. If it doesn’t come off in one sheet then do the process again with the rest. 4. On the counter lay out a double thickness of aluminum foil big enough to completely envelope the ribs – topped this with a double thickness of parchment paper. 5. Place the ribs meaty side up on foil/parchment and generously coat with rib rub. Turn over and coat the bone side. 6. Starting with the parchment paper, fold the paper over the ribs to completely seal them in. Then bring the foil up over the paper and completely seal the package by crimping the seams of foil. 8. Remove pan from oven and carefully open the foil/paper packet (their may be a lot of juice so be careful). Allow the ribs to rest at least 30 minutes or refrigerate over night. 9. Heat an outdoor grill to medium-high. 10. Mix 1 cup of your favorite BBQ sauce with 1 cup water in a small bowl. 11. Cut the cooled (or refrigerated) ribs into 4 sections. Grill the ribs, turning frequently and using a brush baste the ribs with sauce after each turn. Cook until ribs are glazed and nicely browned and heated through. 12. Serve the BBQ Ribs as is or with additional sauce. So there you have it, my favorite summer time BBQ Spareribs. If you haven’t attempted spareribs at home — give this method a try and I’m sure you’ll be pleased with the results. Tender, meaty, and so delicious. Perfect for those Holiday cookouts, family picnics, graduation parties, or any other summer time get together. Once again life in my world has been busy and unfortunately one of the things that gets set aside is my blogging. So I’m finally publishing this post that I started writing last month… thanks for your patience and thanks for reading! June is one of those months where the weather can be so unpredictable… oh wait, that’s pretty much every month in Rochester NY. But seriously, I had some bone-in chicken quarters that I wanted to barbecue and then it rained and rained and rained — so I had to change plans (because I only grill in fair weather). While looking at the cut up chicken on my counter, it reminded me of the years that Lista’s Italian Cuisine was one of the few full service restaurants around Brockport that also did catering. My Dad did a lot of catered events when the restaurant was in business. Everything from weddings, graduations, and corporate events to small affairs in private homes. And not everything was strictly Italian food. Dad was well known for his catering skills and was called on often to create memorable buffets filled with hors d’oeuvres, salads, antipasto trays, carved meats, and of course Lista’s famous pasta dishes. Dad’s roast turkey, ham and prime rib were outstanding… and his attention to detail when garnishing his trays was second to none. One story I like to tell is how Dad would take potato or macaroni salad and mound it up on a serving tray then use heavy mayonnaise to “frost” the whole thing — then using mayo mixed with food coloring, he would fill a pastry bag and pipe on decorations just like a fancy wedding cake. It was pretty impressive! Of course not everything was that labor intensive, in the years between 1960 and 1980 there was a very common buffet served at every party house and catering restaurant around town — I referred to it as the “Rochester Buffet” and it consisted of: Roast Beef au jus (sometimes hand-carved), Herb Roasted Chicken, Baked Ziti, Roasted Tiny Potatoes (sometimes called rissole potatoes), cooked Vegetables (usually green beans amandine or California blend), Tossed Salad, Dinner Rolls… and sometimes a big bowl of Fruited Jello! Many wedding receptions during those years had that same buffet no matter where you went. Still I fondly remember how much I loved that herb roasted chicken (with garlic, lemon and oregano) and those tiny rissole potatoes (crisp outside and creamy on the inside) my Dad would make for those catered events. So since it was raining and I wouldn’t grill outside, and I wanted to avoid turning on the oven and heating up the house… after all it was June! Instead I transformed the ingredients I had on hand into a delicious Chicken Oregano with Potatoes one pan meal that reminded me of those favorites from my past. 1. Trim chicken pieces of excess fat, rinse and pat dry with paper towels. If using leg quarters, separate at joint between drumstick and thigh. If using a whole chicken cut into 8-10 pieces (i.e. 2 wings, 2 drums, 2 thighs, 2 breast pieces – halved if large). Season both sides with salt and pepper. 2. Scrub red potatoes and remove any “eyes” or blemishes with a paring knife. Cut potatoes in half. Set aside. 3. Heat a very large (12″-14″) deep-sided skillet or dutch oven over med-high heat. Add 2 TBSP olive oil, swirl to coat pan, and the chicken pieces – skin side down. Cook undisturbed for 8-10 minutes until fat starts to render and a nice brown crust begins to form. Turn over and cook undisturbed for another 8-10 minutes. Remove chicken to a plate and pour off excess fat/oil from pan. 4. In the same pan over med-high heat, add the remaining olive oil, sprinkle in the crushed red pepper flakes, and chopped garlic. Cook until garlic is fragrant – about 5 minutes. Add chicken pieces back to the pan and arrange the potatoes, cut side down, around the chicken. Add the oregano and lemon slices (reserve quartered lemon) evenly over the chicken and potatoes. Allow to cook undisturbed for 10 minutes. 5. After 10 minutes, turn the potatoes and chicken pieces and redistribute so everything rests on the bottom of pan. Squeeze the lemon wedges over the chicken and potatoes. Season with a little more salt and pepper. Allow to cook for another 10-15 minutes until potatoes are tender and chicken is cooked through (165 degrees) and juices run clear. 6. Remove pan from heat and allow chicken and potatoes to rest 5 minutes. Gently lift portions of chicken and potatoes with a spatula (to preserve the brown crust) and serve with your favorite vegetable or green salad. There you have it, my Chicken Oregano with Potatoes — a delicious meal that is simple to prepare and cook in one pan — that reminds me of my Dad’s catering days. Keeping with the “Rochester Buffet” theme, I served the chicken and potatoes with some California Blend vegetables (broccoli, cauliflower and carrots) but it goes great with any fresh or frozen vegetable or a nice green salad. If you like the bright taste of fresh lemon, go ahead and squeeze a little over the chicken and potatoes just before serving. I hope you find a chance to make this dish… maybe on the next rainy day in Rochester. Memorial Day weekend is the start the grilling season for me. I’ll admit, like most people around here, I enjoy grilling or barbecuing (low and slow) in my own back yard — but I’m definitely a fair-weather cook… no inclement weather or winter grilling for me! I just don’t get the appeal of standing in an open garage wrapped in a parka grilling burgers in January. So this weekend (80 degrees and sunny) I got out there and cleaned up the ol’ gas grill; checked the remaining propane in the tank (praying I didn’t have to drive to the corner and get a refill), and fired her up to cook some burgers and hots for the Lista family. Well actually it was burgers, red hots, white hots, Italian sausage, spinach and feta sausage, and andouille sausage — we like variety. Along with all the charcuterie we also enjoyed several salads including that proverbial Lista favorite Pasta Salad. In my family, pasta salad is a staple at most gatherings. With its colorful fresh veggies, diced cheese and deli meats, pasta salad is the flamboyant cousin of the macaroni salad family — and a refreshing change of pace from the heavier mayo-based variety. I first remember making pasta salad at Lista’s Italian Cuisine as a feature for our “fabulous salad bar” and as a side dish for many lunch specials. We referred to it as Italian Pasta Salad (of course) and it was dressed with a simple vinaigrette and featured fresh broccoli florets, tomatoes, olives, salami and cheese. It seems like pasta salad really came into vogue in the early 1980’s. I remember it becoming more and more popular around that time, and was served at restaurants featuring large elaborate salad bars (remember Charlie Bubbles?) and grocery store that began carrying prepared foods to go. It was around that same time that many of our local taverns began to serve food to their customers (definitely a nice break from pickle eggs and beer nuts). And when a bartender served a burger or beef on weck they could “fancy it up” by adding a side of pasta salad since the traditional oil and vinegar dressing held up better than a mayo-based dressing and thus kept customers experiencing undue intestinal discomforts. There are so many different renditions of pasta salad that if you don’t have a particular favorite you can make it different every time. I tend to be a traditionalist and like the classics, so here is my favorite versions of Pasta Salad based on the one we served at Lista’s and I have made many times since. 1. In a large pot of slated water, cook the pasta per package directions until just al dente (about 8-10 minutes). Drain in a colander and rinse under cool water. Shake off excess water and allow to sit in colander until ready to use. 2. In a small bowl combine 1/4 cup Romano cheese, olive oil, vinegar, dijon mustard, sugar, Italian herbs, salt, black and red peppers. Whisk together with a few drops of water to form a vinaigrette. Cover and refrigerate until ready to use. 3. In a large mixing bowl, combine the broccoli florets, diced tomatoes, sliced zucchini, sliced onions, halved olives, diced mozzarella and salami. Add cooked and cooled pasta and vinaigrette to bowl and toss until all ingredients are combined. Cover and chill for at least 2 hours up to over night. 4. Pour salad into serving bowl and sprinkle remaining 1/4 cup Romano cheese and chopped fresh parsley (if using) over the top as a garnish before serving. There you have it, a Classic Pasta Salad that will work for any pot-luck, picnic or family gathering. Remember to give it plenty of time to chill before serving and keep it colorful and fresh. I hope you enjoy this version of a simple family favorite.